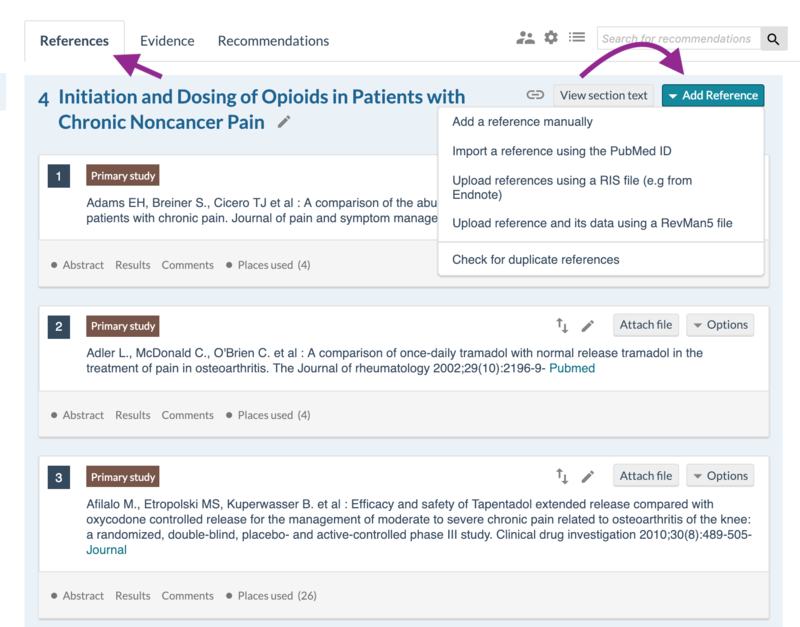 The platform is an authoring and publication platform for Guidelines and Evidence summaries. That means that the platform can be used both to create your guidelines, maintain them so they are always up to date, and publish them through the channel most preferable to you: Directly on our platform, on your own platform using our widgets, embedded in your platform or in your own platform entirely, using our API to export data realtime to your system. Below all the features of using the platform for guidelines described. 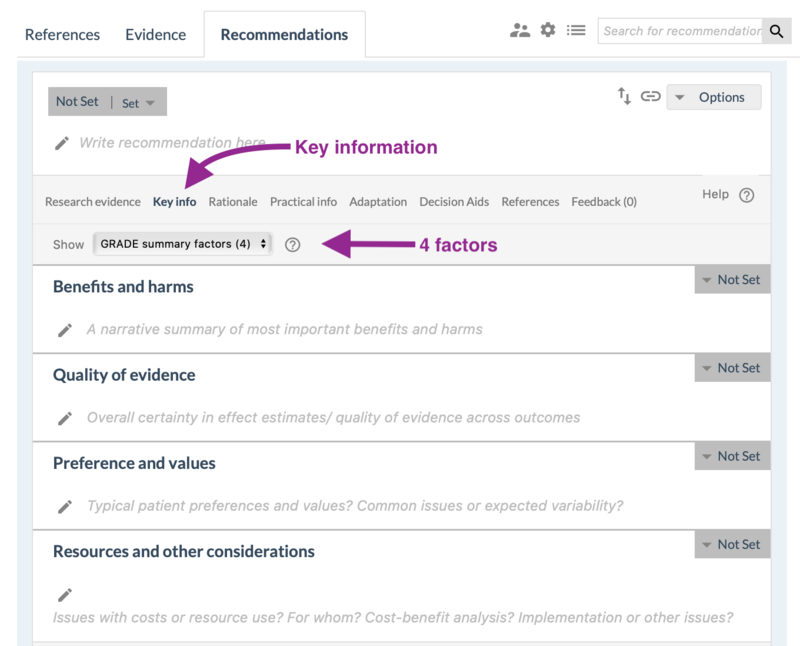 The features for Evidence summaries are the same, except the Recommendation part. All users can use the platform for personal use, but they cannot publish and not make their guideline public. For personal use you can use it for training, education, testing and creating Summary of findings tables that can be exported. As an Organization, you get the full functionality of the platform, with all author and publishing features. Only admins of an organization can create a guideline in the name of that organization. 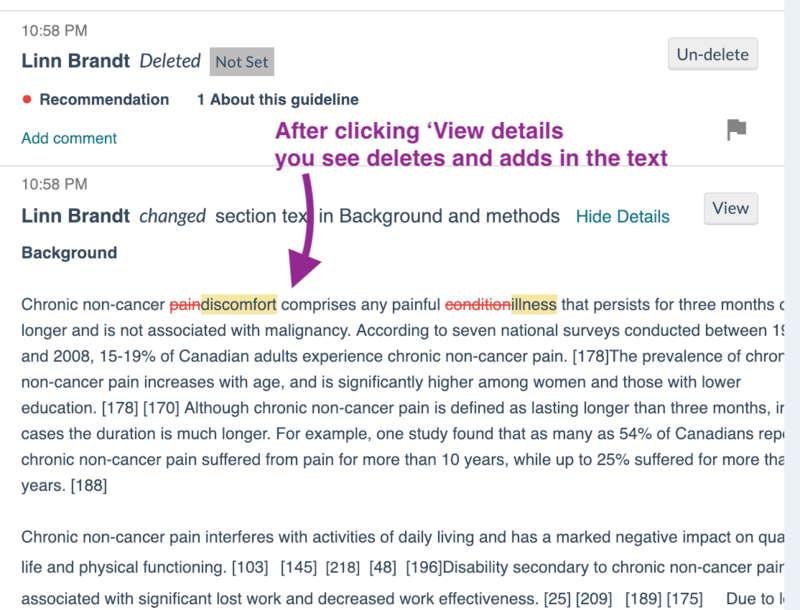 Once a guideline is created, the admins can add Guideline admins, authors, reviewers and viewers. 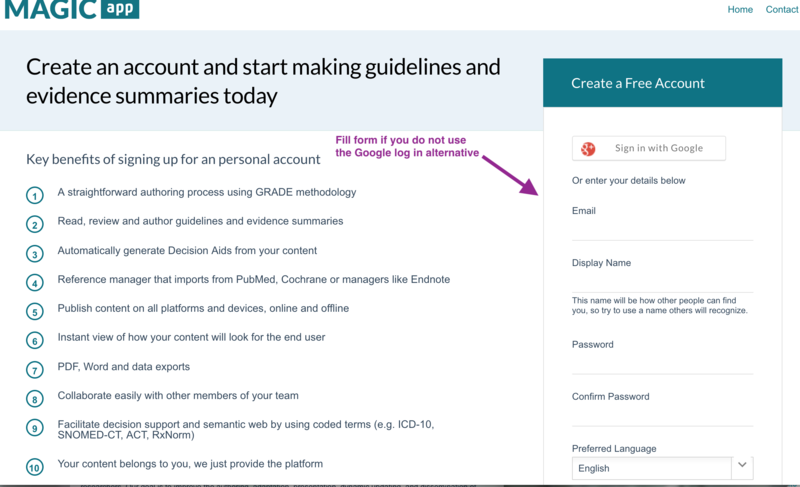 Guideline admins are the only ones that can publish a guideline, edit the Guideline settings and add/remove new admins and authors. All users need to sign up for a MAGIC user account. It is explained below in '1. Log in'. Once you have a user account, you can be added to a guideline, or as an admin for an organization. For your admins to find you when they are adding you to a guideline, use a username that can be recognized, like 'Thomas Agoritsas', not '1234unicorn'. 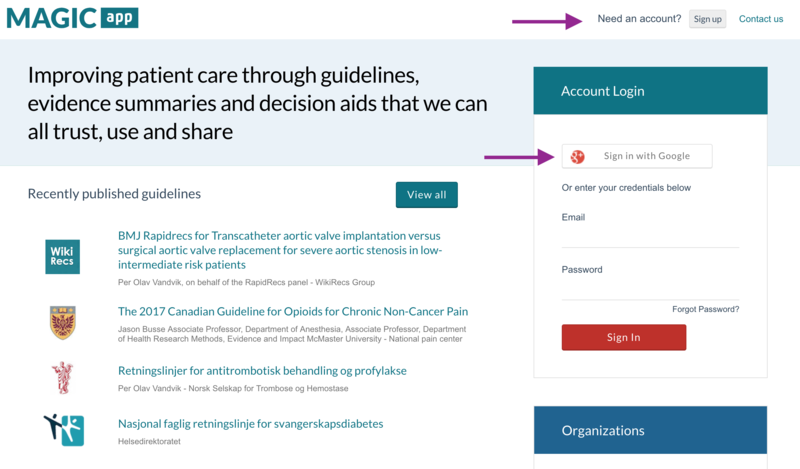 On the home page you see all the Guidelines and Evidence summaries you have access to. All users have access to Public content, and you only have access to content that are not public if you have to be given specific permission by the Admin of that guideline or evidence summary. 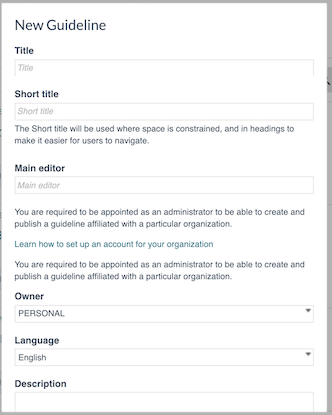 In the 'Sort and filter' menu you can filter on a specific organization, and authors can sort on guidelines they have specific permissions for, or only the public ones or the ones belonging to your organization. You can sort on Name, Owner, Date of recent edit. 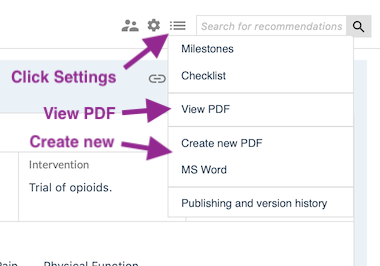 All guidelines have an option menu, where you can get the PDF of the guideline, set it to offline use, read about it and get the direct link. Logged in users access user settings under Account. There you can change your user name, password and Language. You can also see your affiliated organizations, and perform some preference settings. All users will get asked to read and accept the Terms of Service the first time you access content. This explains what you are you are allowed to do and not to do on the platform, how to behave and what to expect. 5. Create a New guideline. The MAGIC platform uses the GRADE methodology to guide users through guideline development. GRADE has become the most used guideline standard in the world, used by small and big organizations, like WHO, NICE and many government guideline developers. Read about GRADE: What is GRADE? These 3 tabs, as their name say, contain the References, the PICO questions, and the Recommendations of the guideline. The content in these tabs are created and edited independently, and in the author process you link them together. 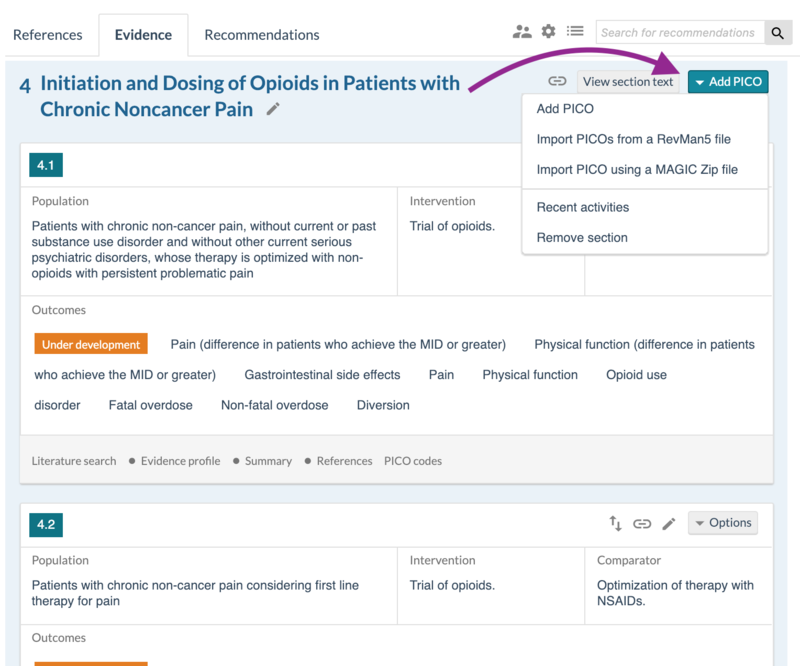 By linking the References, PICOs and Recommendations together, you can state which references/studies supplied the information used for each outcome in the PICO questions, and which PICOs and references/studies that supplied the information used for each recommendation. To create your table of contents, you add Sections. You can create as many sections, sub- sections and sub-sub sections as you want. You can move sections around, rename them, delete and create new ones. Sections can contain References, PICOs and Recommendations, but they do not need to. Move sections and create sub-sections by drag and drop. When you are in Reference view you can add and edit References using the 'Add references' button on each section. References contain structured information like Title, Authors, Published date and so on. You can add files to the Reference (e.g. full text PDFs), that only other authors in your guideline are able to see. 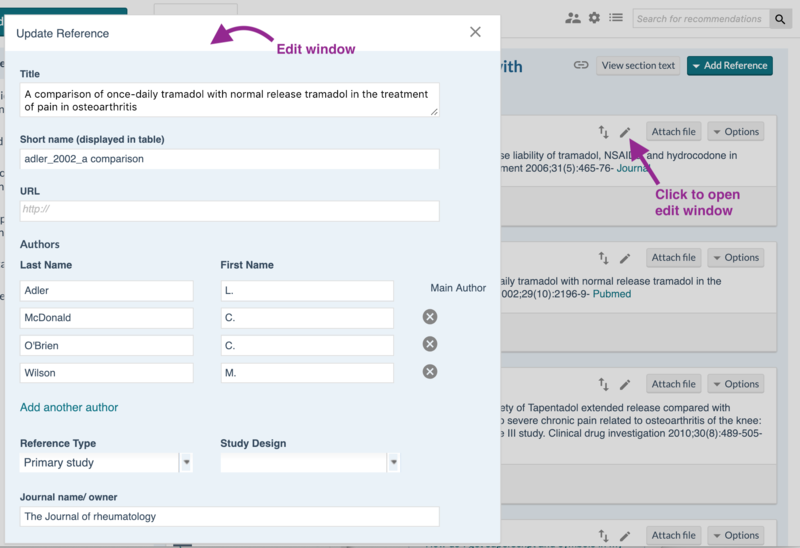 You can assign the reference to a type: Primary study, Systematic Review or Other. This will be used to give you filtered lists when you add references to PICOs later. c) Pull references directly from PubMed. You need the 8-number PubMed ID, it is found below the abstract when you have found the right study in PubMed. To edit references you click on the pen icon. To move the reference, click the up-and-down arrows, and drag the reference where you want it. When you are in Evidence view you can add and edit PICOs using the 'Add PICO' button on each section. a) Manually. You create a PICO and then manually fill the data. c) By using a downloaded PICO Zip file. PICO Zip files are downloaded PICO questions. It could have been downloaded from one of your own guidelines or from someone that have shared their data with you. When you create a PICO with a Zip file all data and attached references will be added. 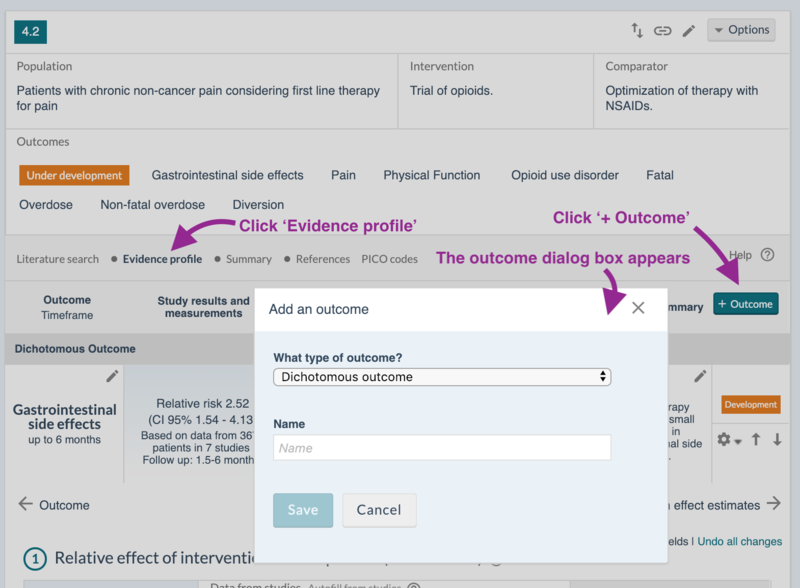 When you have created a PICO question and want to add an outcome, you go to the Evidence profile tab, and click '+ outcome'. A dialog box appears and you add title and type of outcome. There are 3 types of outcomes: Dichotomous, Continuous and Narrative. When an Outcome is created, you can edit it by clicking on the small pen-icons. 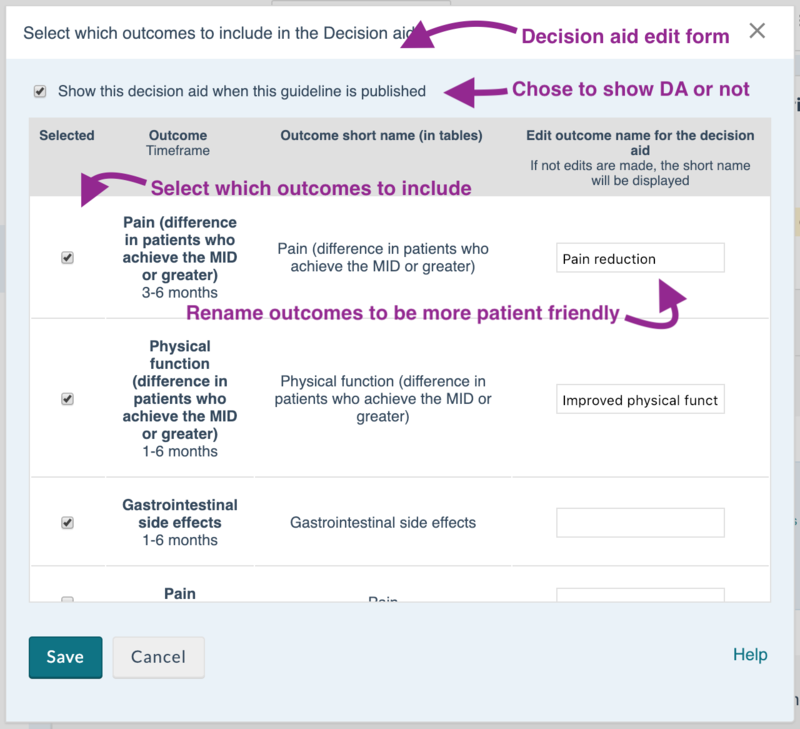 That opens an input form for the different columns in the evidence profiles.There are 4 outcome forms for each outcome. The Description of the Outcome (column 1), The Study results and Absolute effect estimates (column 2+3), The GRADE assessment (column 4), The plain language summary (column 5). 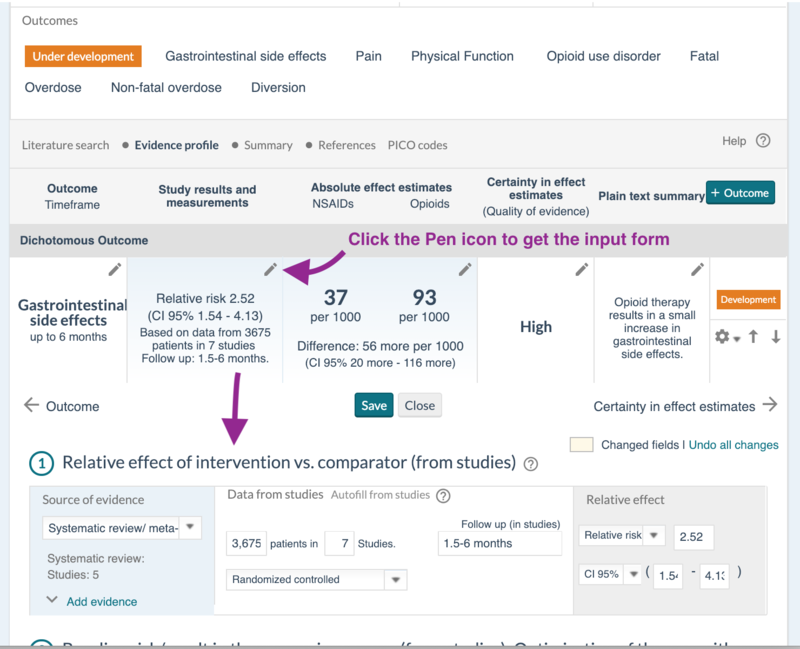 In the The Study results and Absolute effect estimates you can add which Meta-analyses/ Systematic review and primary studies the results are taken from, by linking references from your reference list. 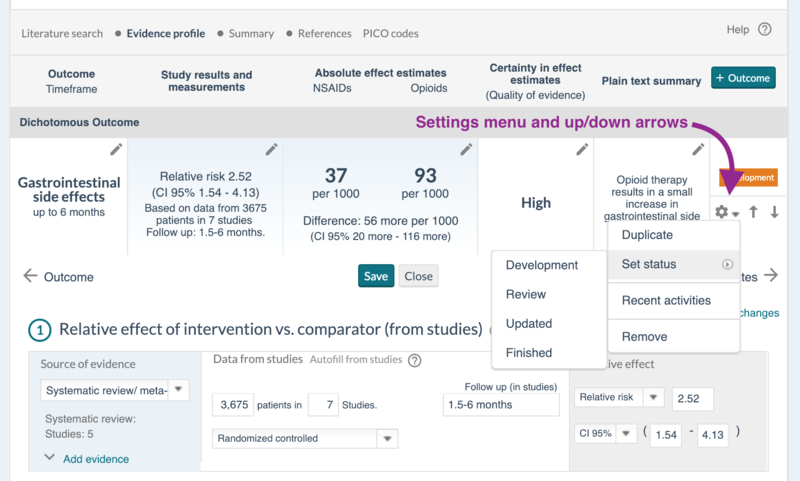 You can assign different studies for your relative effect and your baseline risk, in cases where you do not use the control arm of a meta-analysis as baseline risk. When you do changes the background changes to yellow. You need to save before the changes come into effect. For each Outcome you can set a state: Under development, For review, Updated, Finished. It is done in the Outcome settings menu (cogwheel to the right of each row). In this menu you can also duplicate an outcome, see all recent changes in the activity log, or delete the outcome. Deleted outcomes can be recovered in the main activity log. Beside the settings menu you see arrows that you can click to move the outcomes up and down. For each PICO you can add practical questions. These are not outcomes, but consequences imposed by the different alternatives. There are 12 categories of practical consequences. Click '+ Add Issue' below the outcomes, and choose which type. For each PICO you can add a narrative summary. Go to the Summary tab and input text. For each PICO you can add codes from different terminologies. 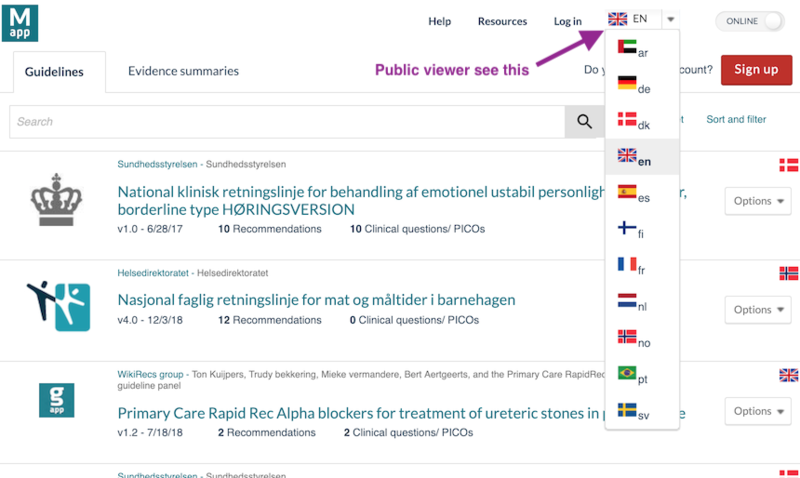 This will be used as meta-data for the PICO, which can enable more precise search from the PICO into study and systematic review databases, and gives Electronic Health Record systems (EHRs) information about content of the PICOs and the recommendations that are based on those PICOs. The coding module has suggestive search, so just add the first letter in the phrase you are looking for and you get suggestions from the terminology you have chosen. Go to the PICO code tab to enter your appropriate terms. Navigate to the Recommendation tab to start adding Recommendations. 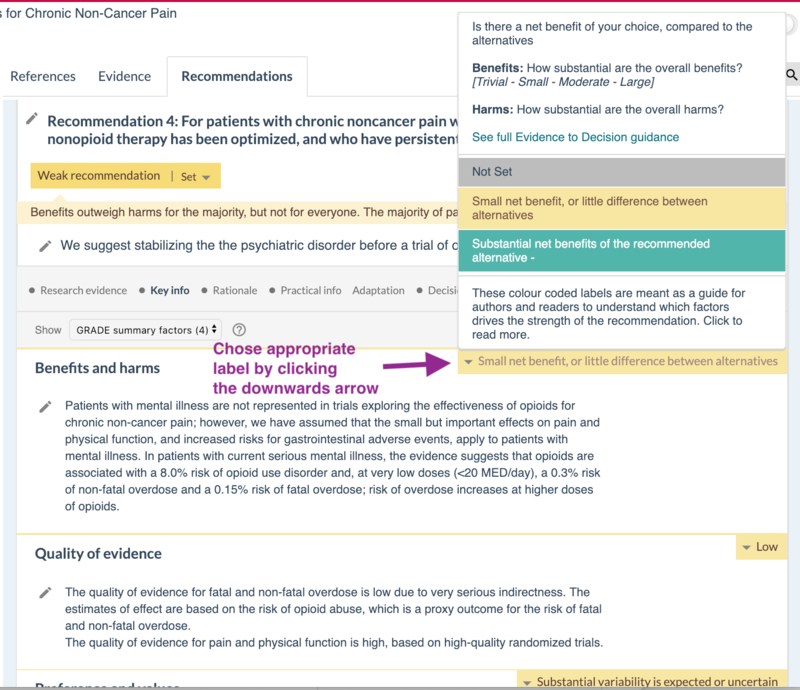 Not all recommendations are based on evidence, you can choose to label your "Recommendation" as a 'Practice statement', 'Statutory requirement', 'Information Box' or keep it without a label. After creating a Recommendation you should add the PICOs this recommendation will be based on. You can add as many PICOs you want, useful in cases you have multiple comparisons or write a combined recommendation for multiple populations. 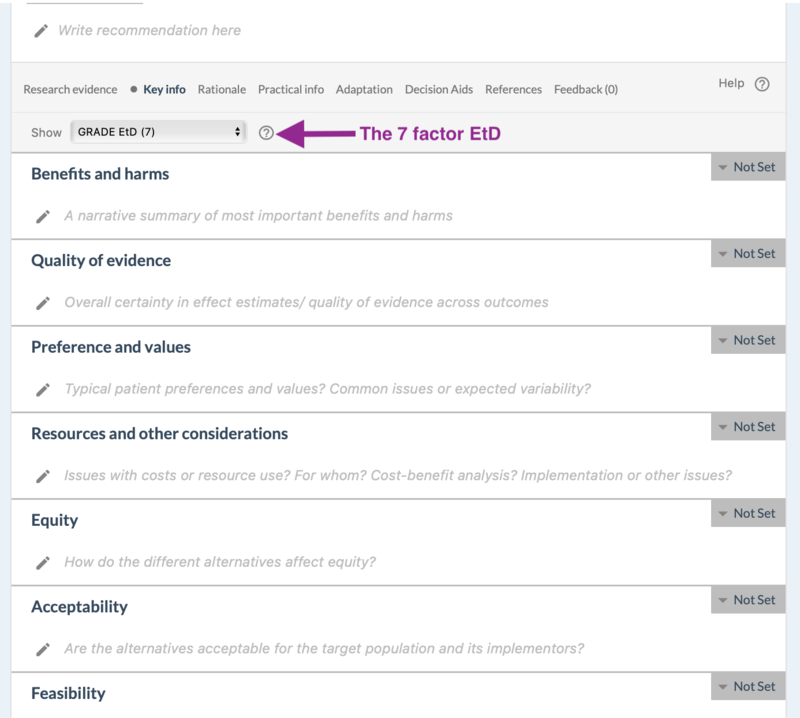 Navigate to the 'Research evidence' tab and choose which PICO to attach. As default the PICOs in the same section show, but you can choose to see and select from all PICOs in the guideline. One PICO can be used for multiple recommendations. 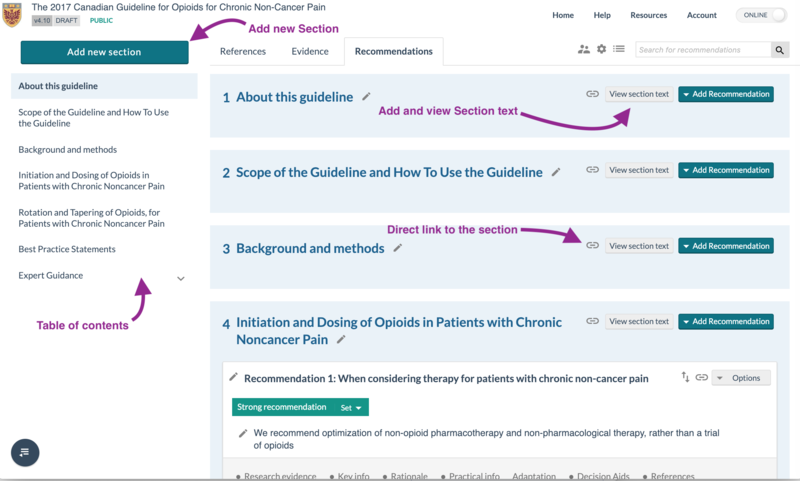 For each recommendation the guideline team should assess the available evidence and information for the topic of question, and following GRADE this is done through the Key information/Evidence to Decision factors. Only factors where you have written text or added a label will be shown to readers. You can set the level of confidence you have in each factors ability to bring about benefits for the intervention that is recommended. 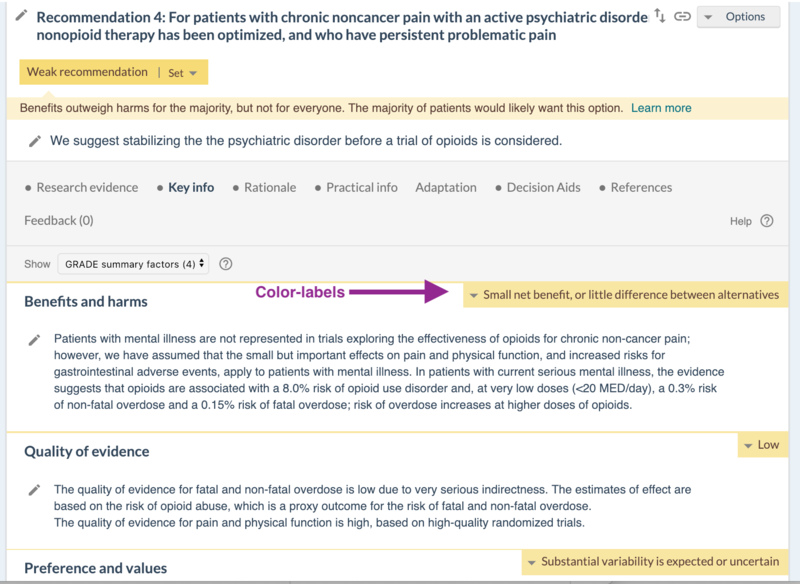 This is both to help guideline authors in your discussion and final decision of the strength of recommendation, but also to give the end user of the recommendation a visual cue of how the different factors were weighted to decide the strength. 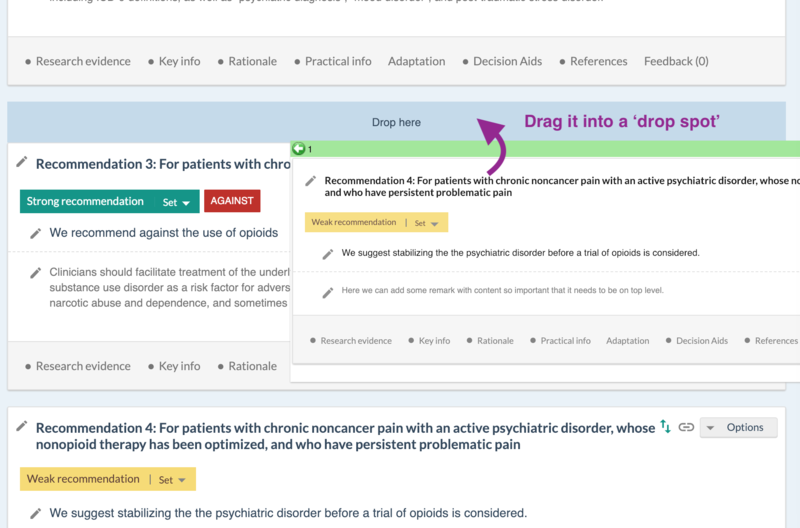 In the Rationale tab the author team should outline the discussion around which intervention to recommend and with what strength. If there were relevant diverging opinions in the team, you could write about that here. If there was any conflict of interests that affected the author team, you could also outline that here. After your author panel has decided what option to recommend, and with what strength, you can write the recommendation text and set the strength. 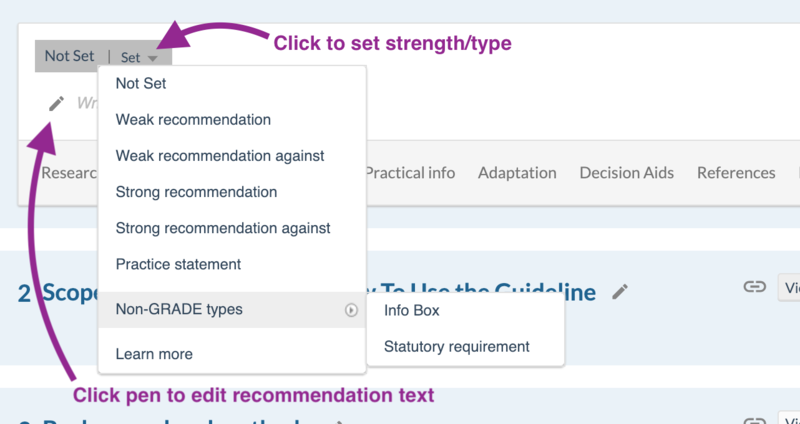 If you decide to write a non-GRADEed Recommendation, like an information box, a no-label Statement or statutory requirement instead, you set that using the same control as the Weak/Strong setting. To get a 'recommendation box' where users see no label (e.g. for statements), keep it as 'Not set'. Setting strength/type is done by clicking on the recommendation label in the top left corner. Each recommendation can have a Header and Remark. Headers are usually used for users to navigate better between recommendations, or as short statement of the recommendation. Remarks are used for information besides the recommendation text, that are regarded so important for the understanding or execution of the recommendation that it have to be shown in the top level. Both Headers and Remarks should be as short as possible, for ease of reading by users. Headers and remarks can be turned on and off. - Export the Recommendation as Word or a data file. In the adaptation tab you should write a statement if you have taken your material from somewhere else (adapted content). 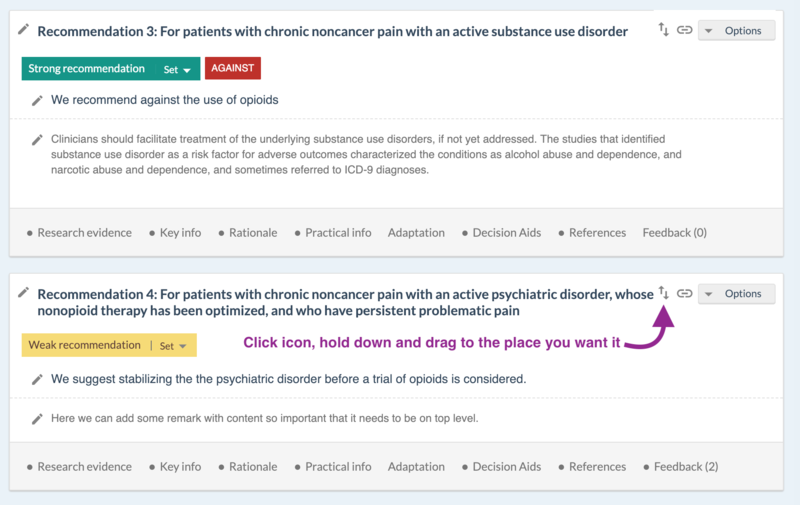 Decision aids are created from all PICOs that are attached to a Recommendation. Information from the PICO is re-used to create these consultation Decision aids. 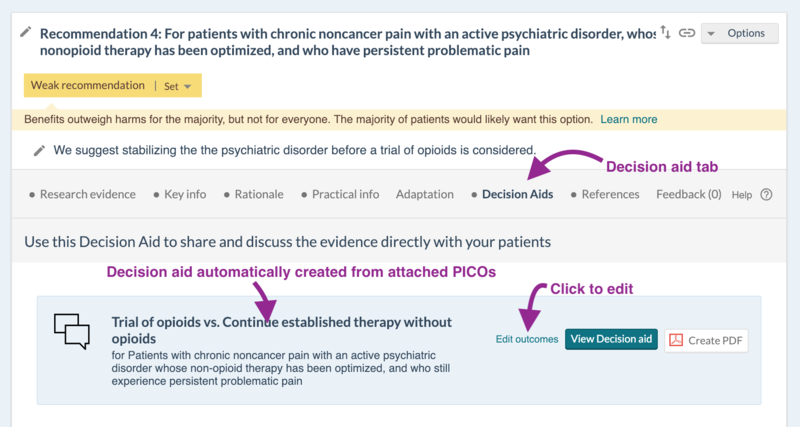 Most data in the Decision aids are locked to the PICO, so it is always updated when the PICO updates. However, you can edit some information. 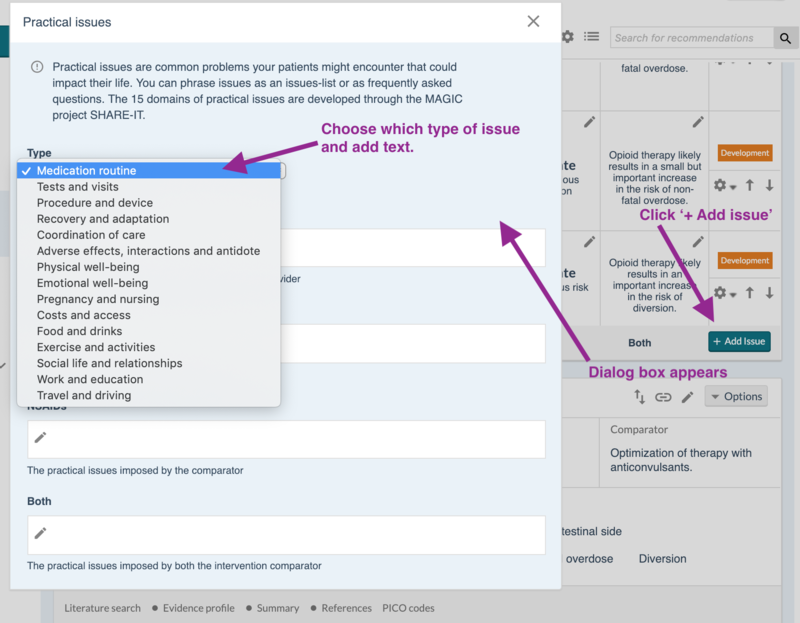 Outcomes can be renamed to be more patient friendly, The same with Population, Intervention and Comparison (P-I-C editing is an upcoming feature, ready approximately Feb 2019). 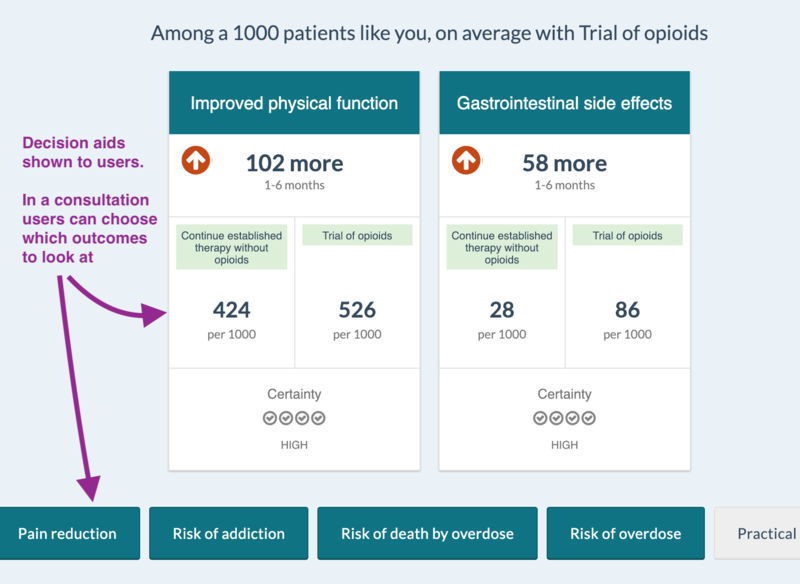 You can also choose not to show a Decision aid to users. 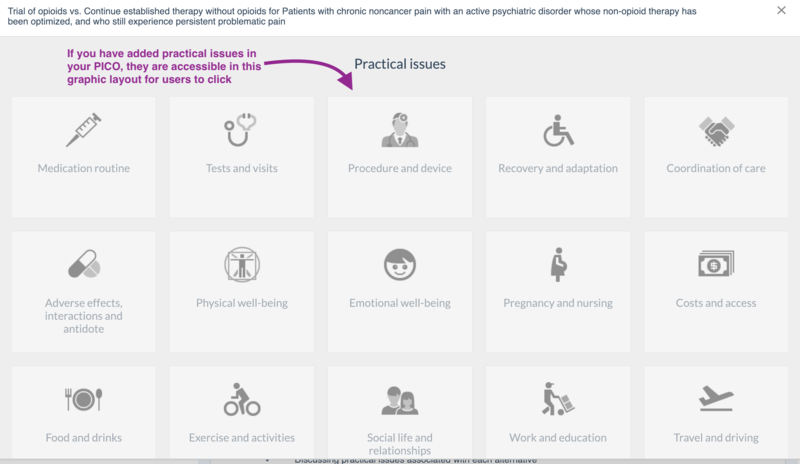 If you have included Practical issues in your PICO, they will be shown in a graphical grid, available for users to navigate by clicking on the type of issue they want to know more about. 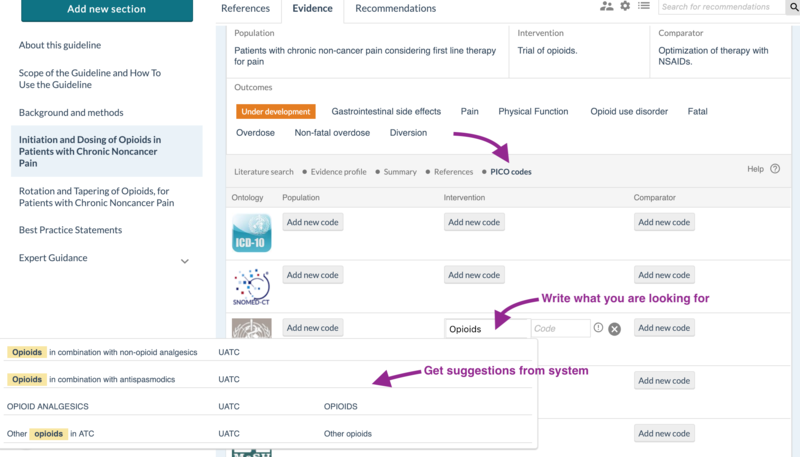 Users, reviewers and authors can give feedback to each recommendation, using the Feedback tab. Users have to be logged in to give feedback. For authors and reviewers you can give access before the guideline is public, in an internal or external review process. Feedback entries can be edited and deleted by the person that made them. Admins of a guideline can edit and remove all entries, regardless of who made it. 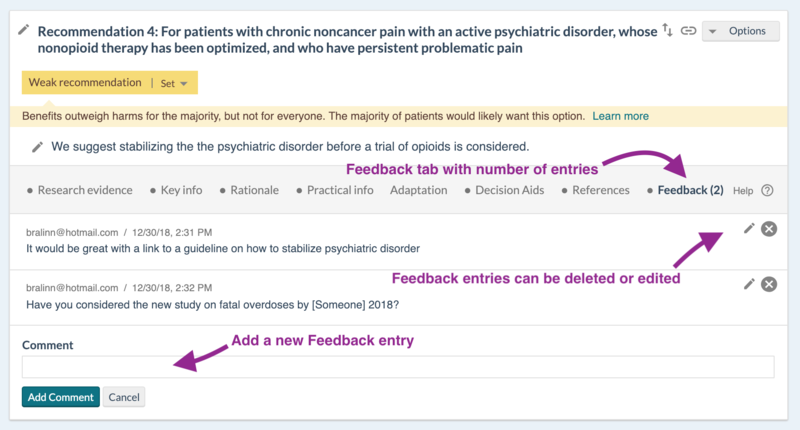 Upcoming feature is the ability for authors and admins to comment on comments, set feedback entries to resolved, show total number of unresolved entries, and send an email to users and admins when a new entry is made or resolved. All placed you can edit text more complex than just a short phrase or number input, you see a text editor just like in Word. You can do all the usual things like making text bold, underline, add special characters, add links and images. During a guideline authoring process, you will often need to re-order Sections, or change order of Recommendations, PICOs or References. You do this by drag-and-drop. References, PICOs and Recommendations have a up-and-down arrow icons. Click it, hold down and drag it to where you want it to be. You can re-order across different sections. Sections do not have arrows, you just click anywhere on the section you want to re-order and drag it to where you want it to be. 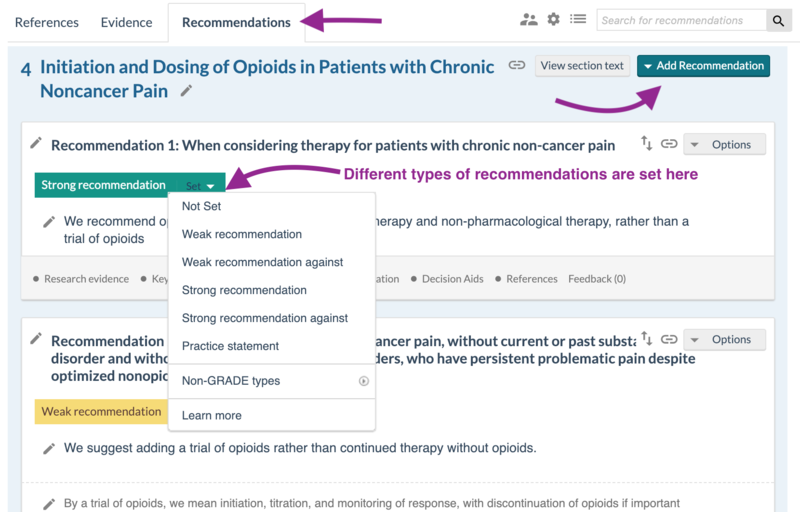 Every time you move a section or a reference we need to re-number all the places the affected references are used, both connected in the reference tabs or outcomes, and where they are used as citations. For guidelines with a lot of references, this could take a while. If you have many section-moves to make, or want to add reference in bulk, we suggest you turn the 'Bulk reference editing mode' on. It is available from the Guideline settings menu. It lets you edit in bulk and update everything after you're done. In this mode only you can edit sections or references, and the other authors are informed that you have put the guideline in 'Bulk reference editing mode'. When you are done, you click 'End bulk reference editing mode' in the same guideline settings menu. 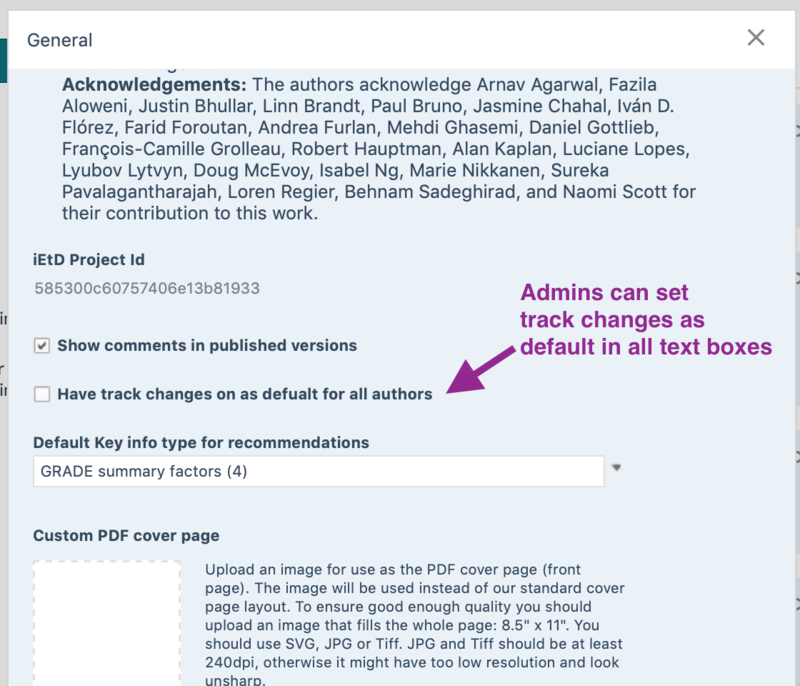 Admins can break other authors 'Bulk reference editing mode'. The platform is a collaboration platform. That means that multiple authors can be editing at the same time. 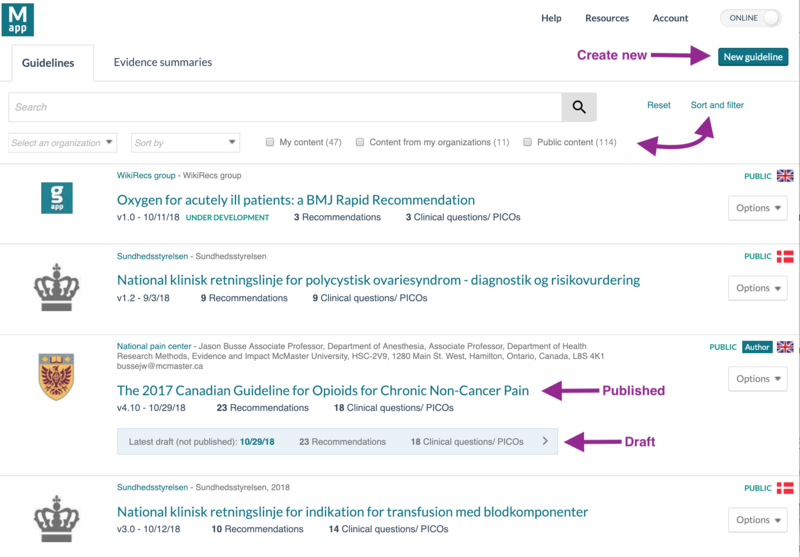 When you access the guideline, you can see how many new edits that have been done since you last visited, and while you edit you see if there are other authors making edits too. 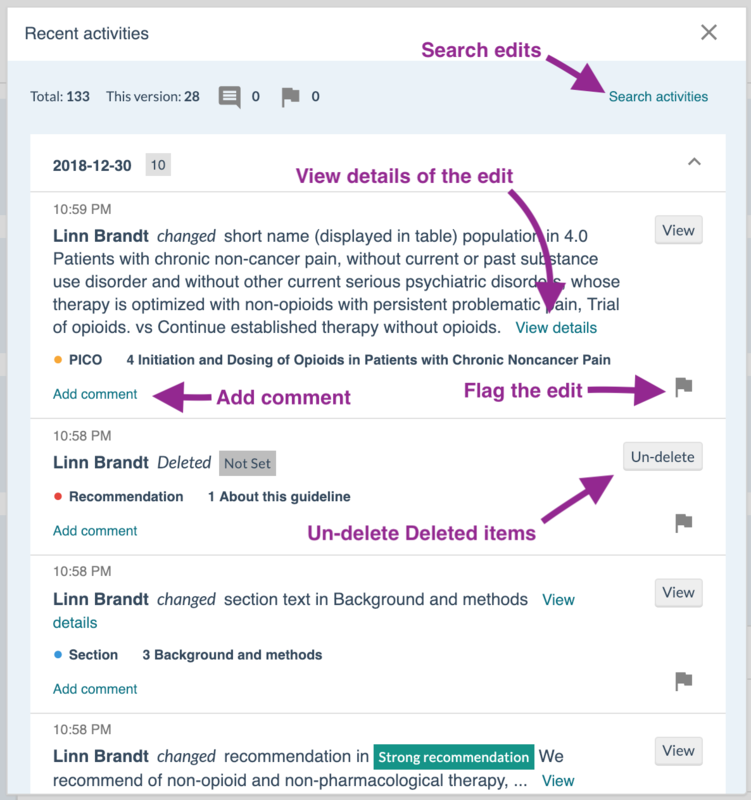 All edits are visible and searchable in the Activity log, available from the top menu of the guideline. If there are new edits, a red circle with number of edits will show. You can also access a filtered 'Recent activities' from the option menu of all References, PICOs and Recommendations, showing edits for only that item. 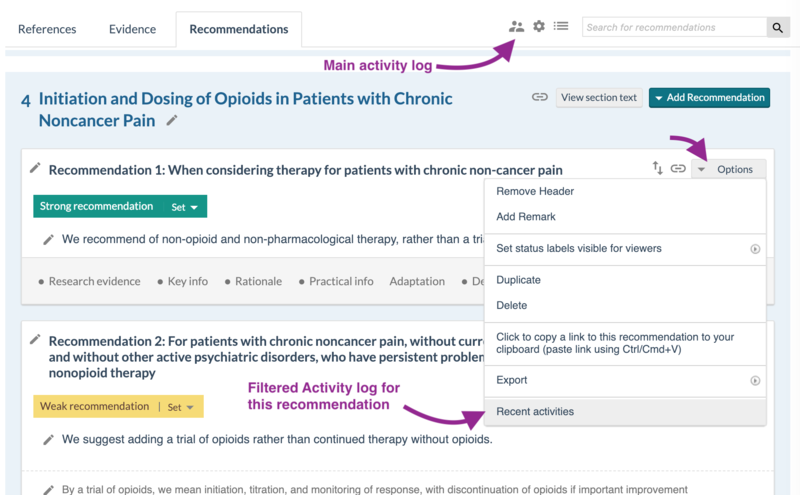 In the activity log you can search for content to see their updates, or click on a piece of content to filter the list for only that specific item, down to the smallest component (e.g. a specific recommendation, or the time-frame of a specific outcome). You can also filter by user who did the edit. You can flag edits for follow up. You can comment on edits (e.g. to explain why they were done). Click 'View details' to see changes that are made. Click 'View' to go to that item to inspect. Click un-delete to un-delete an item that was deleted. You can see where other authors are editing realtime. In the spots where others are editing the pen-icon becomes red, and upon hover, you see who edits and when they started editing in that spot. Each time to click 'Word' or 'Create new PDF' a new updated document is created from your content. The Word document will download immediately, but the PDF takes a bit longer (1-3 min), so a link to it will be sent to you in an email. It will be available in the Settings menu too, if you reload the page. Each PDF have its unique ID, so if you save the links you have access to all versions of the PDF you have created. You can export your PICO (Summary of findings) as Word, data or as a full downloadable Zip file, which can be uploaded into any guideline. The Zip file can be used to share full PICOs with other guideline developer, or to keep for safe storage, with a possibility of uploading it into your guideline later. You can also download the Summary of findings as a .sof file (HTML), that can be uploaded as a Summary of finding table in RevMan. To export your Recommendation, you use the Recommendation option menu. 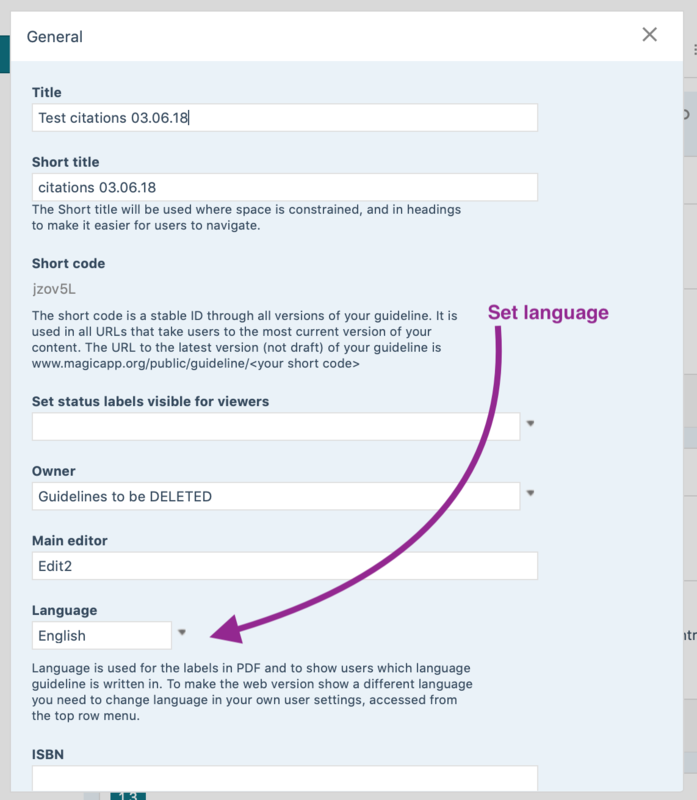 The language set for the guideline will decide which language the Word and PDF will be exported in. 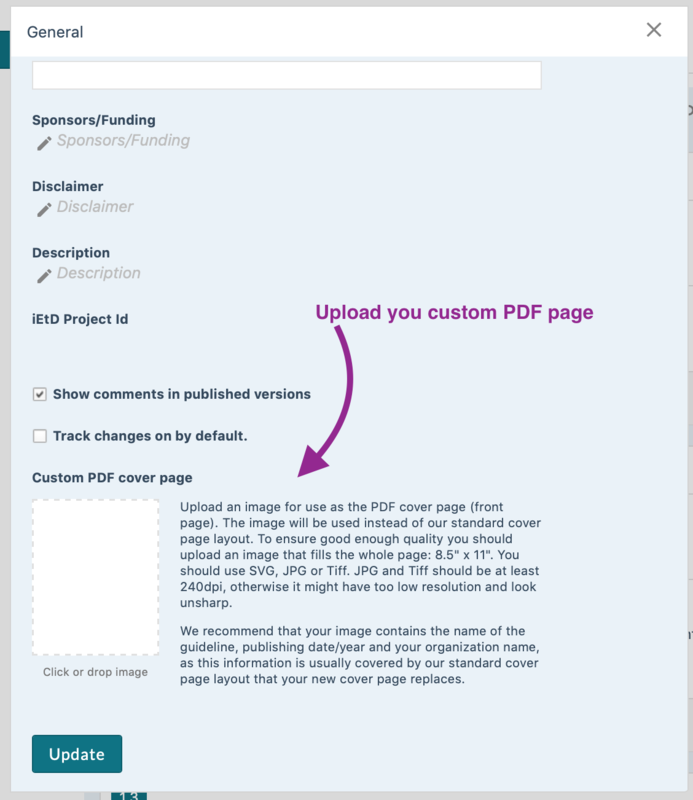 For the PDFs you can upload a custom cover page, in the general settings menu. Widgets are small interactive "windows" that can be integrated on any website as pop-ups or embedded in the text. The widget enables readers on other webpages to view the content as if it was in the MAGIC platform: interactive and multilayered, with all underlying details. The widget can show the content as a pop-up or embed it in the text. PICO widgets can be used in texts referencing the evidence from a PICO question, giving the readers direct access to the evidence without having to leave the place they read. The text can contain a link/icon, and when a reader click it, the full PICO, with summary of findings, narrative text and all details pops up without the user having to move away from the site she is at. 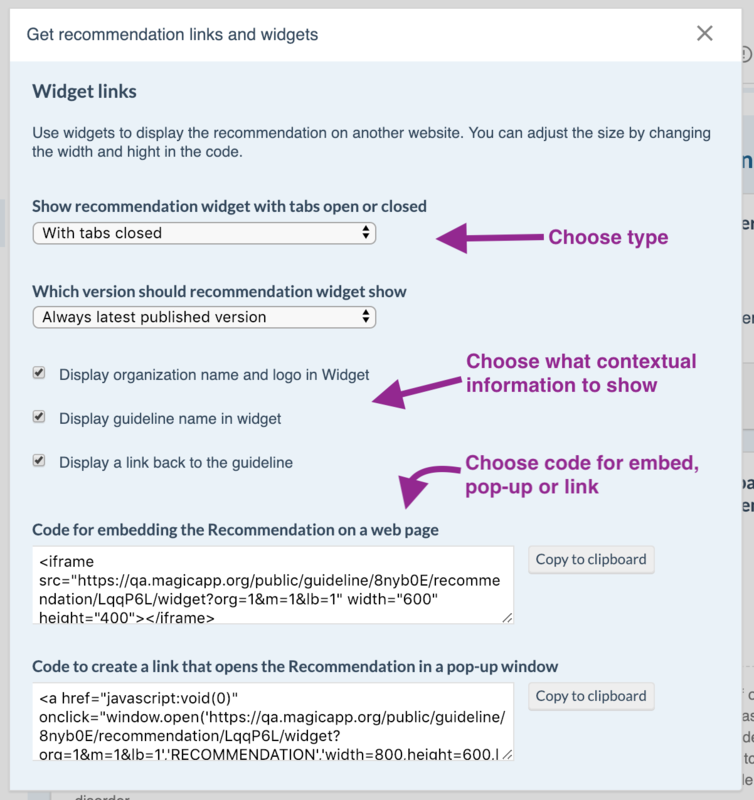 Widgets can also be used by groups publishing guidelines or evidence summaries in their own platforms, to show interactive Summary of findings tables or Recommendations directly on their own page without having to building the interface themselves. The Recommendation widgets are available from the recommendation link icon. The size of the widgets are adjustable, and you can choose to display always the most recent version, or one specific version of the evidence. The Widgets can be shown as open with the underlying content visible, or closed, to save space if the widget is embedded. 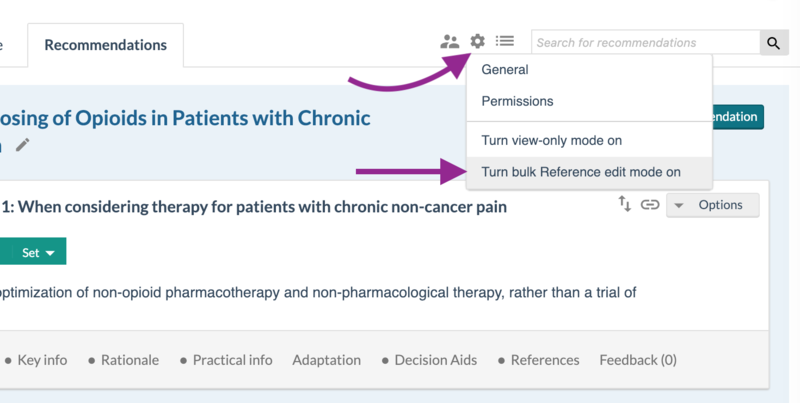 For the Recommendation widget, you can choose what contextual information to show: Name of guideline, name of owner, published date and so on. The links uses specific IDs and shortCodes, to enable the links to work no matter if content is updated or the order of content within a guideline is shuffled. Below is an explanation of the different parts of the link string, so you understand more how it is built and how it can be used. All guidelines, Recommendations and Widgets have a version specific ID and a general "across-versions" shortCode ID. The shortCode ID stays the same throughout all versions, so we use that in the links when we want to send users/display the most recent version. 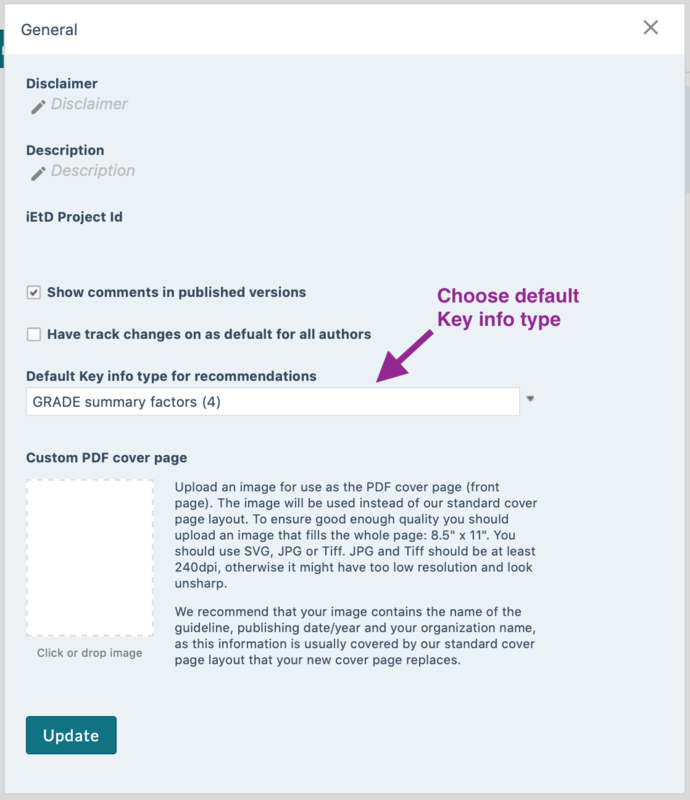 When you click the link icon on a recommendation or section you get a dialog that lets you choose what kind of link you want: From this specific version of the guideline, or from the always most recent version. 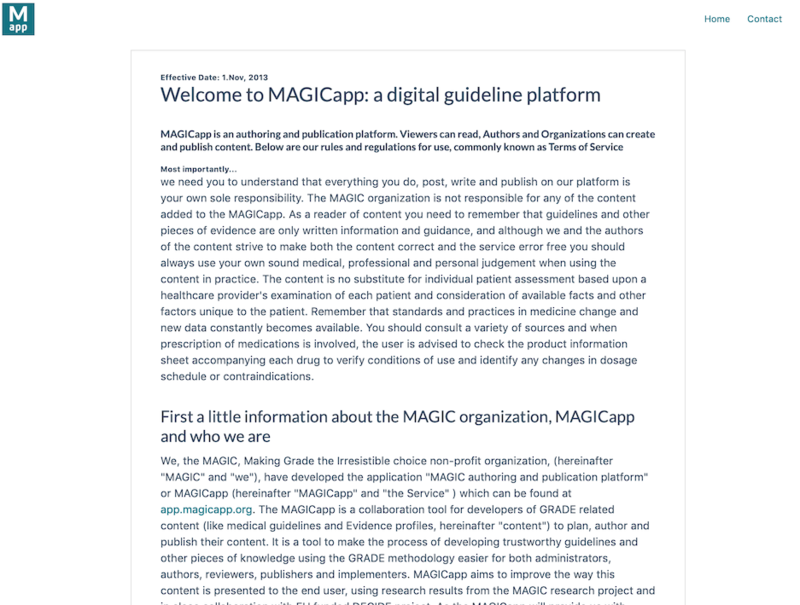 Example: https://www.magicapp.org/goto/guideline/VLpr5E/rec/jXpZdj/da - will open recommendation in the Decision aids tab. If you add users to your draft, they will have access to the draft and all upcoming versions. 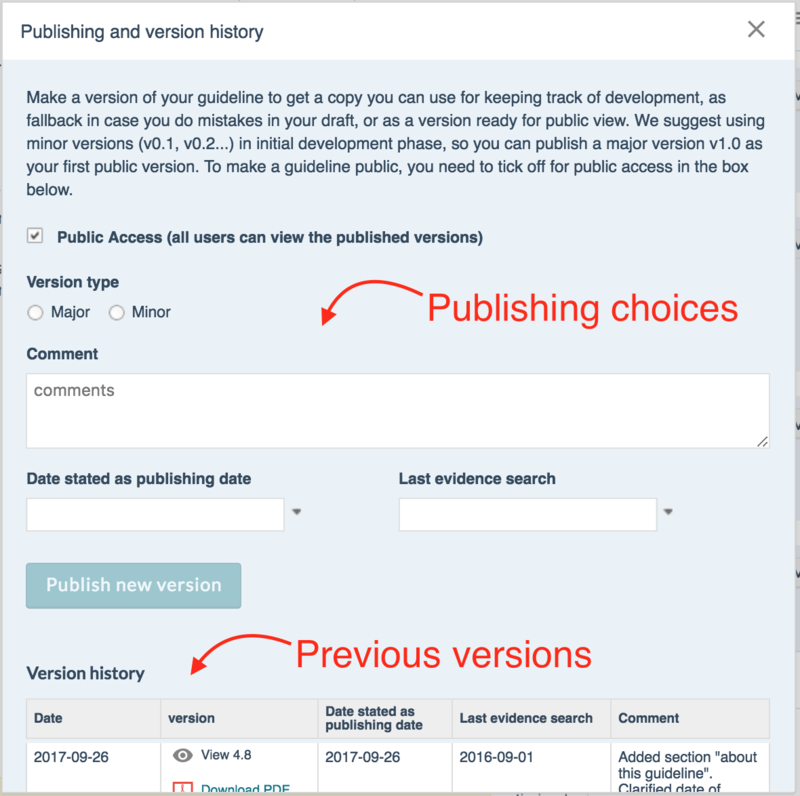 If you add users to a published version, they will only have access to that single version. To add authors, admins and reviewers to a guideline, go to the guideline settings, and to the permissions control. You will then get a dialog that shows all the current users with access, and lets you add new users by searching on their user name. The person you add must have a MAGICapp username. Organization admins will automatically be given access to all the Organization's content. Publishing and public access are set in the Publishing tab in Guidelines settings. Publishing different versions and making a guideline public is two different things on our platform, even if they are often used as synonyms elsewhere. You can publish many sequential versions, for internal review, for peer review, for safe keeping or to keep a stepwise version history. But, it is not until you decide to release it for public access that the versions become publicly available. When ticking off for 'Public access', all users on the internet can find your guideline and read it. The previous non-public versions will not be accessible for the public. If you change your mind or need to withdraw the guideline from public view, you simply un-tick the 'Public access' and the guideline will no longer be able to be found, opened or read. When publishing a new copy, you always keep your draft copy that you can edit further. It is clearly marked with a gray 'Draft' label.